Can I buy In-App Purchases through VPP? How do I set up my work email on my iPad? Why should I buy an iPad and not an Android tablet? Which case should I buy for my iPads? 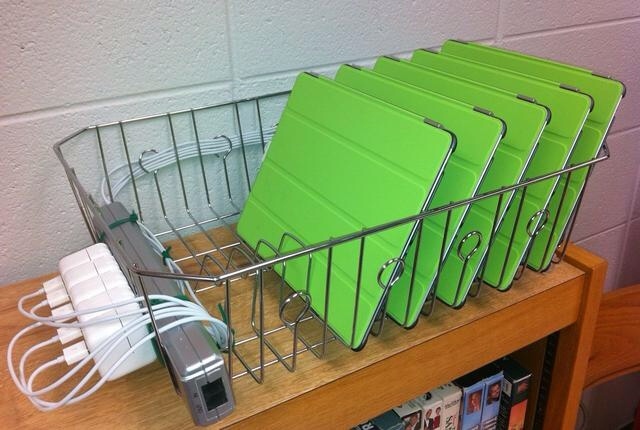 How can I charge and store my iPads? What do I do if a school iPad is lost or stolen? How do I connect an iPad to LT_OPEN? How do I connect my iPad to a projector? Is there a list of good Apps for the iPad? How do I restore a locked iPad with a forgotten passcode? These are all free and if not automatically appearing on your iPad, can be found in the app store. For Education, we would recommend buying a 32GB, Wifi only iPad. You will get the best prices by purchasing through XMA’s Scottish Government National Framework Agreement. The iPad offering best value for money and most suitable for educational purposes is currently called ‘iPad’. Contact XMA for more details. Cases can be procured from XMA. The recommended case is the STM Dux. Some details can be found in the iPad Accessories section of the Framework Agreement – for additional model and pricing details, contact XMA. Most classrooms have a lockable drawer or filing cabinet in which iPads can be securely stored at the end of the school day. Whilst there are a number of custom-designed charging/storage products available, it is also possible to build a low-cost solution simply by using a multi-gang socket and a dish rack. What do I do if a school iPad or computer is lost or stolen? The loss or theft of computing equipment is classed as an ICT Security Incident. If a loss or theft occurs, the school should contact CGI on 0800 783 7158 and report it as a security incident. The CGI ICT Security Manager will investigate and consult the Council’s ICT Security Manager and Information Governance unit. Further information can be found here on the Orb. if Property Security have been notified. Following notification on the above, Information Security will contact the school again but if you would like to discuss any of the above in the first instance please call Information Security on 0131 529 7987. Instructions on how to connect an iPad to LT_OPEN can be found here. There is also a video tutorial available here. iPads and iPad Minis can be connected to a projector using a VGA Adapter. VGA Adapters can be procured through the XMA Scottish Government National Framework Agreement. iPad Retina/Air/Mini requires an Apple Lightning VGA Adapter (Product Code: MD825ZM/A). iPad 2/3 requires an Apple 30-pin to VGA Adapter. iPads can also be connected via AppleTV, please contact the team for advice before purchasing. Collections of iPad Apps that have been reviewed by teachers can be found at Appitic and Educational App Store. In addition, Apple has organised apps into collections which can be accessed via iTunes. Please note: any device restored to factory settings must be re-enrolled in Meraki (MDM).